One of the most striking vistas in Egypt greets you on arrival on the West Bank at Luxor: as you pass through lush, irrigated fields, desert mountains loom ahead in which are ranged the gaping black holes of tombs and temples of the necropolis of ancient Thebes. Once called the ‘Place of Truth’, the isolated canyon now known as the Valley of the Kings consists of 62 known tombs of pharaohs and nobles, its steep, scorching cliffs devoid of life and a fitting domain for the inhabitants of the sarcophagi who were awaiting immortality. Many of the tombs display an extraordinary level of artistic design with well preserved colour paintings and sunken reliefs on the walls of the passages and chambers. The nearby Temple of Hatshepsut; the massive pair of statues known as the Colossi of Memnon and Medinat Habu, beautifully sited against the backdrop of sheer mountain cliffs, are other remarkable historical highlights to be found on the West Bank. 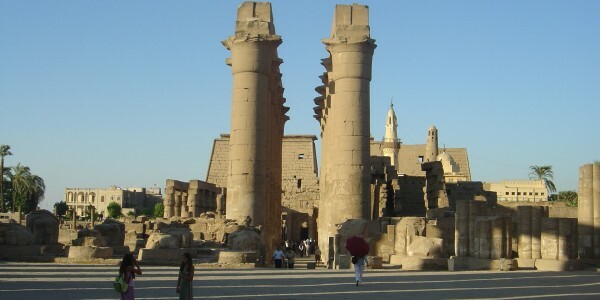 In Luxor itself are sited the spectacular complex of sanctuaries, temples, columns and obelisks of Karnak, dedicated to the Theban gods and the greater glory of Egypt’s pharaohs, as well as the strikingly graceful Luxor Temple built by the New Kingdom pharaoh Amenhotep III. 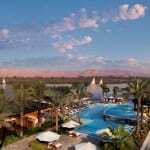 The town of Luxor is a pleasant place to explore by horse-drawn trap and it is also possible to arrange a felucca ride on the Nile from the central corniche or enjoy a balloon ride over the West Bank.